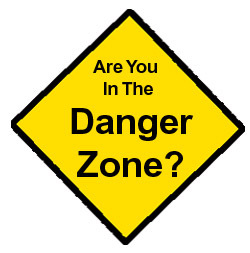 All too often companies enter the Danger Zone when they opt to sever ties with their marketing firm to save money during challenging times. This goes beyond the well-known adage that the worst time to cut marketing is when business is down. Professionals may have to take on extra marketing assignments that are not seen as a high priority. Teams who relied on external expertise may not have the skills needed to run effective programs. Marketing teams may develop “tunnel vision” without an outside perspective. Staff may not have the time to continually monitor and learn about the constantly changing marketing tools available today. Ineffective and dated marketing programs will not reach customers or drive sales. Because marketing programs simply may not get done due to time limitations, awareness and sales even among loyal customers may wane. The competition will see an opportunity to create FUD (fear, uncertainty and doubt) about your business. Employee turn-over may increase resulting in added expenses for recruiting, hiring and training. Instead of completely severing ties, talk to your firm about using their senior team members as strategists, sounding boards, and counsel to help see you successfully through tough times. And, if they want all or nothing, you know where to find us!